Happy Valentine's Day From the ACFC! Hi, all. Here's what your sick and twisted president has been cooking up in Photoshop. 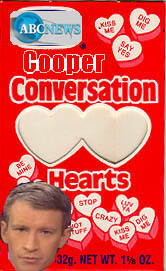 Any diehard Anderfan will appreciate these candy hearts which spout Cooperriffic platitudes. Unfortunately, these hearts are not available in any store, so you'll probably have to make do with stuff like "Fax Me" or "Be Mine." My suggestion would be to forego buying the Necco variety altogether and actually eat something with fat in it.